Cycling is fun but can be a little daunting especially if you’re inexperienced. Whether it’s for leisure or as a form of workout, bicycling helps to work out your heart, blood vessels, and lungs, which guarantees better health. And while the whole experience is refreshing, there are several pitfalls. As such, we have some excellent tips that will make your bicycling better. When cycling, the engine is your body and whatever you eat becomes your fuel. Rather than eat junk food, it advisable to health a healthy meal. Be sure to keep track of the calories that you burn when you exercise to help you in planning your diet. Besides, don’t leave your water bottle or that hydration backpack behind when heading out. Excessive thirst when riding is an indication that you’re dehydrated. The best practice when cycling is to keep drinking small bits of water as frequently as possible. There’s no way to emphasize this enough. When riding on roads, be sure to obey all the road signs. Use hand signals to communicate with the drivers and pedestrians when turning. Be sure to avoid all the blind spots and keep an eye contact with the drivers whenever you approach an intersection. When cycling on narrow roads, ride on the lane with the vehicle for better visibility. Watch out for potholes, abruptly opening vehicle doors and avoid riding side by side with a fellow cyclist. Lastly, don’t make a mistake or riding your bicycle with headphones or earphones on lest you’ll not hear the car horns and other signs of danger. As a cyclist, you should arm yourself with the essential equipment and attire. Practice how to repair your bike in your home garage. That way, you can never again stress over a flat tire when away from home provided you have your pump and tools with you. What’s more, you need the right attire when cycling. A quality helmet that’s lightweight, adequately ventilated and fits snuggly will help prevent you from head injuries in case you have an accident. Whether it’s during the summer scorching sun, the frigid winter temperature or when it’s raining, make sure that you have the right clothing and shoes specific for every weather to avoid any inconveniences. 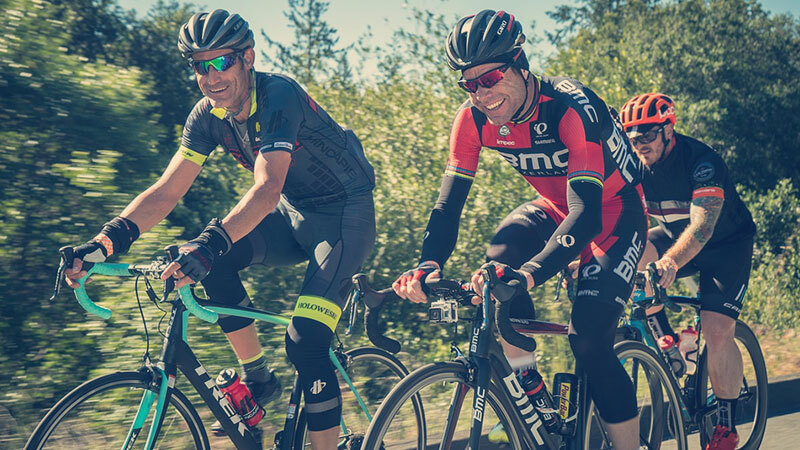 During the less than ideal conditions, you want that hot weather jersey & proper fabric shorts, a rain jacket or a fender that will guarantee comfort. We all have different body sizes, and you’ll never meet two people who match in everything including body size, leg, arm, and torso length. If your bike is not your size, comfort riding comes with having it set to suit you. When the handle, stem, and saddle are not of the right size, the odds are high you’ll assume a bad body position which will make riding difficult. You don’t want to strain muscles more than necessary. When cycling, maintaining a static position puts too much pressure on particular body muscles. Learn to adjust your hands and body position as often as possible to change the angle of your back, legs, and neck. That helps to exert pressure on different muscles and nerves reducing the chances of poor posture. At all times maintain your arms in a relaxed position to prevent them from getting numb. If you place your hands on the curved parts of the handlebars will get your head, shoulders, and neck cramped. When your arms are in a relaxed position, the shock from the bumps on your whole body is significantly reduced. At times, you might discover that you lack the motivation. Why don’t you approach a friend so you can get pumped up to grab the handlebar and hit the road? Even if it means joining a cycling, do it, and you’ll derive even more fun. At all times, obey your body. After riding for some time, remember to take some rest and probably take a bite of some snack so you can recharge. Besides, the time offer will help the muscles to heal if you happen to experience some pain. While practicing is noble, a good mastery of cycling comes with not assuming the little details such as safety, proper gear, and posture. Practice the tips, and you’ll become a pro cyclist.